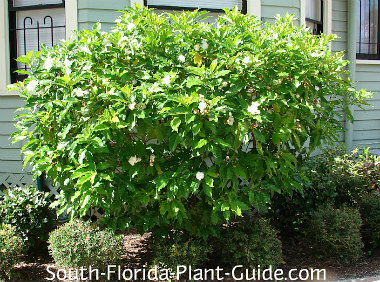 Cape jasmine - sometimes called crape jasmine - is a wide-growing shrub with sweetly-scented flowers. Also known as "Poor Man's Gardenia," these jasmine plants have glossy leaves similar to gardenia. They also have ruffled, snowy white flowers a bit like baby gardenias. The scent isn't the same but it's a very sweet fragrance - more so at dusk. The beauty of this shrub is it's easier to grow than gardenia - more cold tolerant and less attractive to bugs. 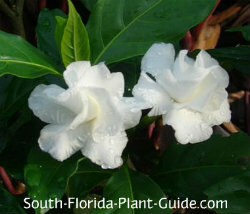 Cape jasmine flowers heavily in spring and then blooms on and off during the summer. It's a good shrub to use where you need to fill in a wide area, and can be grown as a small flowering tree. This plant is a moderate grower for full to part sun, though it actually likes part shade and will flower there. You can keep it about 4 or 5 feet tall and wide. Evergreen with large, shiny, deep green leaves, this jasmine (though not a "true" jasmine) is moderately cold hardy, doing best in Zone 10A and warmer areas of Zone 9B. Place in an area protected from strong winds. Though a colder winter may defoliate the plant, it should flush back out in spring. This plant needs regular waterings but likes a well-drained location. Trim occasionally to shape. 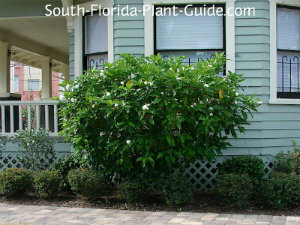 This jasmine shrub grows fairly wide, and ideally should be planted 3 feet out from the house. Come away from a drive or walk about 3 feet. If you're planting a row or grouping, place them 4 to 5 feet apart. They can be grown in large containers as long as watering is regular and sufficient. 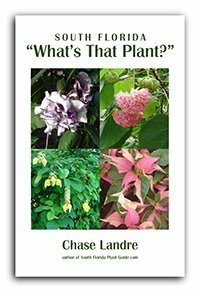 COMPANION PLANT SUGGESTIONS: In a part sun to part shade area, try cat's whiskers, purple queen, orange bird of paradise, Japanese boxwood, and variegated arboricola.